In 1794, Saint Seraphim took up the solitary life in a cell in the forest. This period of extreme asceticism lasted some fifteen years, until 1810. It was at this time that he took upon himself one of the greatest feats of his life. Assailed with despondency and a storm of contrary thoughts raised by the enemy of our salvation, the Saint passed a thousand nights on a rock, continuing in prayer until God gave him complete victory over the enemy. On another occasion, he was assaulted by robbers, who broke his chest and his head with their blows, leaving him almost dead. Here again, he began to recover after an appearance of the most holy Theotokos, who came to him with the Apostles Peter and John, and pointing to Saint Seraphim, uttered those awesome words, "This is one of my kind." 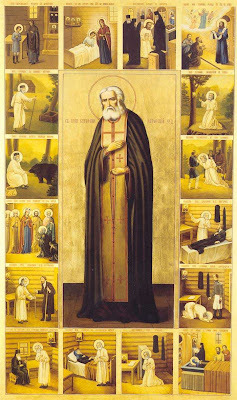 In 1810, at the age of fifty; weakened with his more than human struggles, Saint Seraphim returned to the monastery for the third part of his ascetical labours, in which he lived as a recluse until 1825. For the first five years of his reclusion, he spoke to no one at all, and little is known of this period. After five years, he began receiving visitors little by little, giving counsel and consolation to ailing souls. In 1825, the most holy Theotokos appeared to the Saint and revealed to him that it was pleasing to God that he fully end his seclusion; from this time the number of people who came to see him grew daily. It was also at the command of the holy Virgin that he undertook the spiritual direction of the Diveyevo Convent. He healed bodily ailments, foretold things to come, brought hardened sinners to repentance, and saw clearly the secrets of the heart of those who came to him. Through his utter humility and childlike simplicity, his unrivalled ascetical travails, and his angel-like love for God, he ascended to the holiness and greatness of the ancient God-bearing Fathers and became like Anthony for Egypt, the physician for the whole Russian land. In all, the most holy Theotokos appeared to him twelve times in his life. The last was on Annunciation, 1831, to announce to him that he would soon, enter into his rest. She appeared to him accompanied by twelve virgins-martyrs and monastic saints-with Saint John the Baptist and Saint John the Theologian. With a body ailing and broken from innumerable hardships, and an unspotted soul shining with the light of Heaven, the Saint lived less than two years after this, falling asleep in peace on January 2, 1833, chanting Paschal hymns. On the night of his repose, the righteous Philaret of the Glinsk Hermitage beheld his soul ascending to Heaven in light. Because of the universal testimony to the singular holiness of his life, and the seas of miracles that he performed both in life and after death, his veneration quickly spread beyond the boundaries of the Russian Empire to every corner of the earth. Thou didst love Christ from thy youth, O blessed one, and longing to work for Him alone thou didst struggle in the wilderness with constant prayer and labor. With penitent heart and great love for Christ thou wast favored by the Mother of God. Wherefore we cry to thee: Save us by thy prayers, O Seraphim our venerable Father. Having left the beauty of the world and what is corrupt therein, O Saint, thou didst settle in the Monastery of Sarov. And having lived there an angelic life, thou wast for many the way unto salvation. Wherefore, Christ hath glorified thee, O Father Seraphim, and hath enriched thee with the gift of healing and miracles. And so we cry to thee: Rejoice, O Seraphim, our holy Father. From the Great Synaxarion of Holy Transfiguration Monastery, Brookline, MA.